A look at James Comey’s tough-on-crime career shows that his worst scandals had nothing to do with Hillary Clinton’s emails. It would be tough to find anyone whose public standing has seesawed the way former FBI director James Comey’s has over the last five years. After taking up leadership of the bureau with a near saint-like aura in 2013, Comey became liberal enemy number one during the 2016 presidential campaign for his investigation of Hillary Clinton’s email server — and then earned conservative enmity for deciding not to charge her. His standing fell to a new low after November 2016 when he was widely derided by liberals, but cheered by conservatives, for supposedly tipping the election to Trump, only to rebound in the eyes of those same partisan detractors once Trump fired him last year. With a new book out and a full schedule of media appearances, Comey’s image is once again being rehabilitated, though some liberals continue to hold a grudge against him over the email shenanigans. But despite what some of his detractors will tell you, the worst blemishes on Comey’s record have nothing to do with Hillary Clinton. A few high-profile acts of resistance to some Bush-era excesses have papered over his much longer record as a privacy-shredding extremist who has repeatedly advocated trampling basic rights for the sake of national security. Despite his much-hyped acknowledgement of the bureau’s past misdeeds, Comey’s FBI continued its long-standing pattern of racial profiling and criminalizing lawful activism. And completely forgotten today is Comey’s record in the private sector, where he did the political bidding of his corporate employers. Until the 2016 debacle, Comey always shrewdly managed his public image, aided by an army of journalists who readily repeated favorable talking points. Whether it will work again remains to be seen. Comey made his first splash on the national stage by developing Project Exile, a tough-on-crime program that mandated federal sentencing for gun crimes, including mere illegal possession. In practice this meant that overwhelmingly black citizens were banished to federal prison for a minimum of five years, far from home, where they would be lucky to get any visitors — hence, “exile.” It’s the only anti-gun violence program the NRA supports; Trump thinks it’s “tremendous” and wants to bring it back. 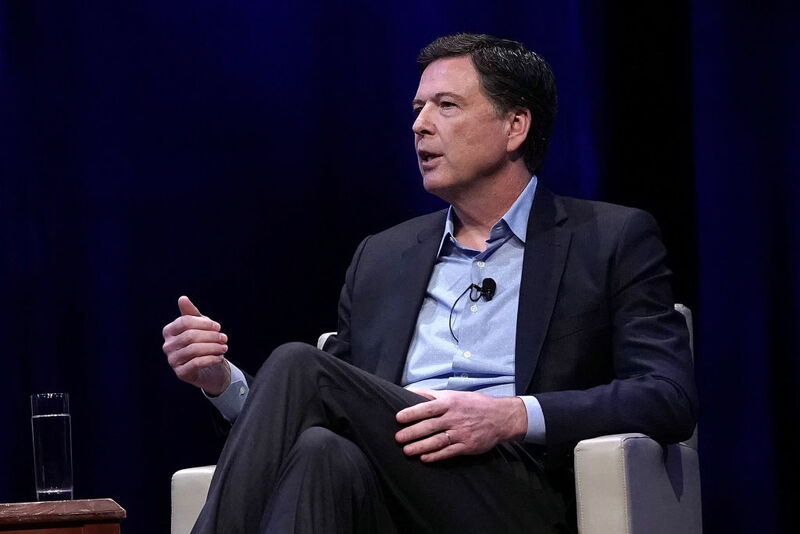 Comey’s tough-on-crime credentials made him an attractive recruit for the Bush administration’s Justice Department, which he joined as deputy attorney general in December 2003. In that capacity, Comey, together with Attorney General John Ashcroft, went after leftist attorney Lynne Stewart, in one of the Bush administration’s most egregious “war on terror” prosecutions. A longtime defender of the country’s most vilified accused, Stewart had spent years representing Omar Abdel-Rahman, the radical Muslim cleric known as the “blind Sheikh.” Accused of terrorism-related crimes, Rahman was affiliated with the Islamic Group (IG), an Egyptian organization on the State Department terrorism list. In 2000, Stewart violated an administrative agreement she had signed with prison authorities by relaying a statement from Rahman, addressed to supporters of IG, to the news media. At the time, the Justice Department chose not to pursue the infraction, which, at most, should have been punished with disciplinary action before the legal bar. But nearly two years later, Ashcroft and Comey absurdly charged Stewart with material support for terrorism and sought to put her in jail for thirty years — the rest of her life, in effect. More than a thousand letters of support from law professors, prosecutors, retired judges, and former clients convinced a judge to give her a more lenient sentence of twenty-eight months. Prosecutors under Ashcroft and Comey appealed and ultimately eked out a ten-year sentence. Stewart, who had breast cancer, spent almost the entirety of her remaining life in prison, thanks largely to Comey. Comey’s admirers like to say that he’s an apolitical public servant who “has never been driven by a discernible political agenda.” In partisan terms, that’s true. But Comey has always embraced an agenda of black-and-white prosecutorial zeal that cares little for basic civil liberties or the suffering of those it targets. Comey’s time in the Bush administration has been heavily mythologized, to the point that in 2013 Jake Tapper characterized his career as that of a “civil liberties superhero.” The perception stems chiefly from two incidents: Comey’s dramatic refusal to sign off on Bush’s warrantless wiretapping program in 2004, and his authorship of a memo that rebuked Bush-era torture. But widespread accounts of both episodes are less than fully accurate. While it’s true that Comey threatened to resign over Bush’s unconstitutional warrantless wiretapping program, his objections were limited to one aspect of the program — its bulk collection of email metadata; he was fully on board with letting the government listen in on Americans’ calls without a warrant. In fact, Comey had signed off on the program when it was first created. And while Comey did help produce a celebrated 2004 Justice Department memo that seemed to renounce torture, the fine print did no such thing. A footnote made clear that it didn’t change the authorization of interrogation tactics in earlier memos, making waterboarding and other forms of torture the Bush administration had been carrying out nice and legal. In fact, through the rest of his time in the Bush administration, Comey ardently defended the civil liberties-shredding “war on terror” measures that much of the country then found outrageous, such as Section 215 of the Patriot Act, which allows the government to obtain a court order forcing telecom companies to hand any communications deemed “relevant” to a terrorism investigation. He also opposed proposed shield legislation that would have given journalists legal protection against revealing their sources. In other words, Comey the “civil liberties superhero” was arguing that Bush and any other president had the power to simply accuse an American of a crime and lock them up for as long as they wished, a radical belief that wouldn’t be outdone until a decade later when Obama claimed the right to kill a US citizen without trial. In the Washington Post, novelist and lawyer Scott Turow decried Comey’s actions as “trial by news conference,” and criticized him for not citing any legal authority, engaging in an act of public relations, and potentially swaying a future Supreme Court decision with unverified claims about evidence. As the ACLU later pointed out, Padilla was never charged with any of the crimes Comey outlined in this press conference. Perhaps this was because of the implausibility of what Padilla was accused of doing. Having passionately defended and enabled some of the Bush administration’s most extreme “war on terror” measures, Comey resigned from the position in 2005. It was time to make some money. Obama’s nomination of Comey to be FBI director made a certain amount of sense. There was always something Obama-like about Comey, an affable, soft-spoken, and PR-conscious operator who understands the value of a well-deployed symbolic act. Soon, journalists were calling Comey “perhaps the most complex and philosophical figure ever to occupy” the director’s position, and gushing over his more relaxed dress code. The reality was different. At the same time Comey was telling Americans to be “deeply skeptical of government power,” he was in the midst of a months-long campaign to force Apple, Google, and other tech companies to build “back doors” — or security flaws — into their products, so law enforcement could easily snoop through suspects’ phones. Comey relentless fear-mongered about the dangers of encryption, claiming that it “threatens to lead us all to a very, very dark place,” and that law enforcement was “going dark” — in other words, entirely losing the ability to gather evidence — because of privacy protections. Comey’s claims focused on the locked phone of one of the San Bernardino shooters, which Comey repeatedly claimed the FBI couldn’t unlock, keeping vital evidence hidden. Ultimately, the bureau did unlock it, without Apple’s help, and it yielded no clues. Under Comey, the Bureau continued to collect huge stores of email and internet data without warrants, essentially the same program that Comey has been lionized by much of the press for taking a stand against during the Bush years. And he went further: in 2016, Comey made the bureau’s top legislative priority a bill to allow the FBI collect a person’s browser history without a warrant in terrorism and spy cases. Comey’s decision to make agents visit Martin Luther King Jr’s memorial is talked up as a method of growing by learning from past mistakes. It doesn’t appear to have helped, because under his leadership the FBI continued to use religion and race as considerations in profiling suspects, and even before Trump won the election, agents carried out a nationwide sweep of innocent people based on their Middle Eastern backgrounds and Muslim faiths. At least Comey’s FBI made sure to spy on other nonviolent protesters from different racial backgrounds, too. Such problems predate Comey, of course. Yet he did little to nothing to curb such behavior, instead continuing to approve broad powers that are ripe for such abuse. Comey’s tenure at the head of the FBI will probably forever be defined by his handling of the Clinton email investigation. But many things he’s done are arguably worse scandals. Don’t cry for James Comey. His years of work for disreputable entities in the private sector has made him a fabulously wealthy man, and his firing has only made him even more fabulously wealthy. Trump’s martyrdom of the former FBI director all but guarantees he’ll remain a part of public life for years to come — which makes it all the more vital we have a proper understanding of his record, stripped of the moral mythologizing that has gone into overdrive in the Trump years. As with so many of the president’s nemeses, the case of Comey is a good reminder that simple knee-jerk opposition to anything Trump-related is not real politics. Branko Marcetic is a Jacobin staff writer. He lives in Auckland, New Zealand.